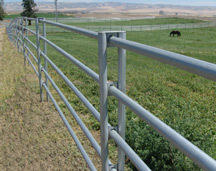 Built to be the best and safest livestock fencing panel available. 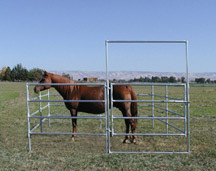 Noble Panels can be used as portable or permanent horse fencing. The fence panels can be clamped together to make a Round Pen, Arena, Paddock or perimeter fence. Lasts longer with less maintenance than a wood fence, barb wire fencing or electric fencing. 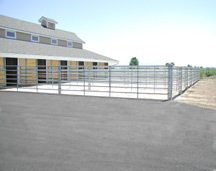 We manufacture this new style of permanent livestock and horse fencing out of the same galvanized steel tubing as our high-grade panels and gates. 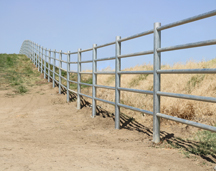 The post and rail fence system is the perfect solution for continuous fencing of uneven terrain. NOBLE ESTATE FENCE is our premium post and rail system. The beautifully sleek look of this fence is designed to flow up and down with the contour of the ground. 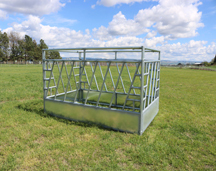 It is ideal pasture or perimeter fence, also Paddock/Runs and Arenas. 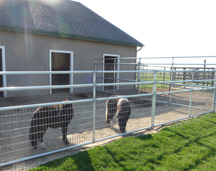 This fencing is horse safe, extremely durable with zero maintenance. 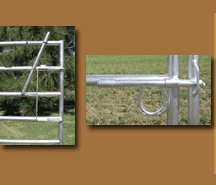 NOBLE PANELS & GATES will help you design and build Paddocks and Runs to fit your special horse fencing needs. Available in 3, 4, 5 or 6 rail fencing panels. Panels can attach directly to your shelter, barn, or shedrow or can be installed with the Noble support post. The Noble Ultra Mesh panels are specifically designed for use in mare and foal paddocks where there is a need for a safe secure fence. They are also excellent for almost all livestock: llamas, alpacas, emus, sheep, miniature horses, swine, dogs, and more. This one-piece panel/gate combination integrates a 4' or 6' Bowgate into a 10' long or 12' long panel. It has an 8' high rail the full width of the top of the combo as well as a full width ground rail...making it the strongest on the market. Also available in Ultra Mesh. 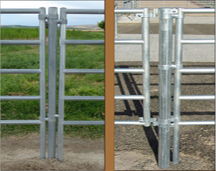 Noble Cattle Feeder Panels can be mounted against posts in a straight line bunk or can be clamped together in a rectangle to feed from all sides. Available in 6’, 8’, 12’, 14’, or 16’ lengths. Can be made in custom lengths upon request (up to 16’). 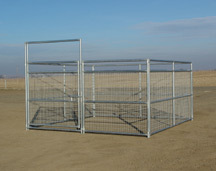 These mesh panels are perfect for the needs of smaller animals. They integrate many of the same materials as our standard mesh products at a smaller size and at a lower cost. A gate/fenceline is only as good as the support posts that hold it in place. This guideline will provide post recommendations to ensure that your gates/panels have the correct support. The perfect travel corral system. Can be set up in just minutes..no tools required! 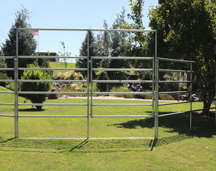 Comes with five 7' long by 4 ½' high, 3 rail panels and one gate panel (includes chain latch). 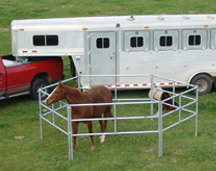 Panels can be secured for travel to the inside of your trailer (via supplied trailer mount "D" rings and nylon straps).